• 1,572 sq. ft., 1 bath, 3 bdrm single story - $159,999 - Closing Costs Offered! Sydnors Point, Richmond - Location, Location! 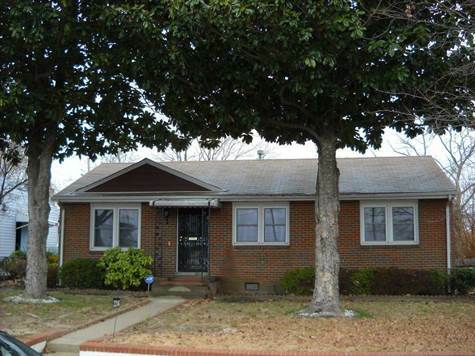 Coming soon – Roomy brick rancher close to Carytown, Byrd Park, Maymont, the Carilon, downtown and so much more. Owner says sell! Priced well below local sales, and priced over $44,000 below the assessed value - and it is not bank owned, a short sale, or needs anything to make it ready to move into. Home has 3 bedrooms, 1 ½ bathrooms, a large family room, spacious eat in kitchen and a huge great room on the back of the house. Some other great features are the sun room, the large rear deck for outdoor entertaining and the energy saving vinyl replacement windows. Seller is offering $3000 towards the buyers closing costs. And a one year total home warranty for added peace of mind. Seller willing to make some updates to meet buyers tastes – ask about our SMART Home Program. Grants and FREE Down Payment Money Available! !